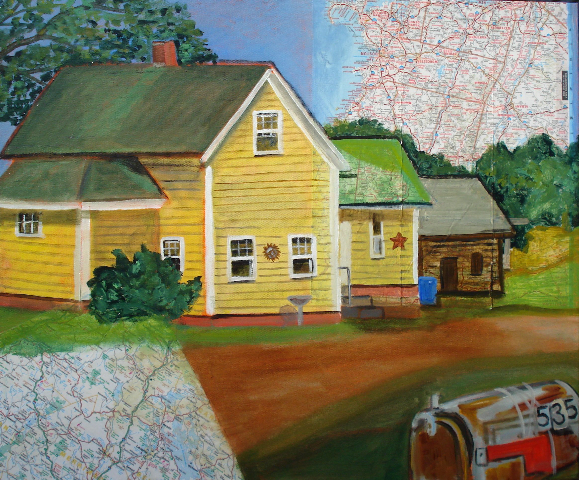 This is a painting I did of my brother's farm house. When my brother was renovating an old farm house he bought that was 150 years old or more, he discovered an antique woman’s shoe concealed in the wall. We heard that people used to do that for superstitious reasons but I didn’t find out why until today when I was at the Castine Historical Society in Castine, Maine. They had a number of shoes on display that had been found in the houses around the area—some date back to 1600’s as this yankee New England historic town is that old! It’s said that they were thought to ward off evil spirits while building a house. June Swann has written a wonderful article about the practice and I read here that it may have replaced an even older superstition of human sacrifice used in foundations of buildings! Why shoes? Shoes take on the shape of the wearer and are as close to a body as one can (legally) bury in the walls of a house. Usually children’s and women’s shoes are what have been discovered and that may be because they were less expensive than men’s shoes or were replaced more often so would not be missed. While feng shui is not based on superstitious belief, the idea of protecting a home from negative energies is very much a part of the practice. I can’t imagine stuffing a pair of Manolo Blahniks or Jimmy Choos in the chimney flu for good luck, can you?